The Republic of Korea is one of the world’s most forward-thinking nations, but its gambling laws belong to a bygone era. 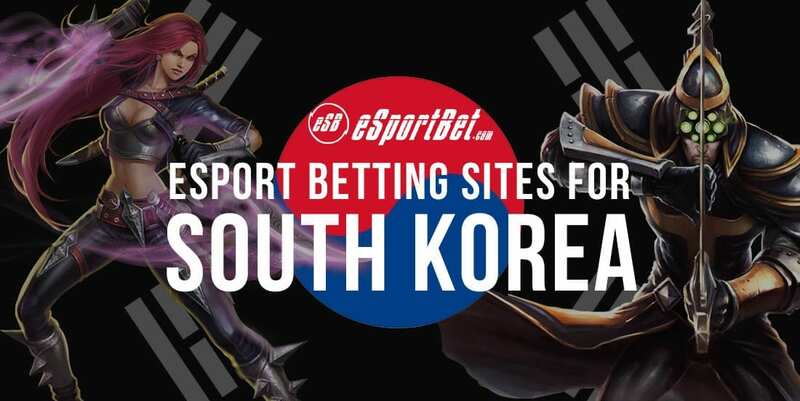 Find out what you can and cannot do when betting on esports in South Korea, as well as which online bookmakers offer the best odds on your favourite leagues and tournaments. Before you do anything else, you need to find a trusted online bookmaker that holds a full gambling license in a recognised regulatory jurisdiction. The sites above fit the bill, and we recommend signing up at all of them so you can guarantee maximum value for money every time you bet. Next, you have to add some money to your betting account. Korean esports bookies accept a number of fast, convenient payment methods, so you can start placing wagers as soon as you confirm your first deposit. If you want to take advantage of a welcome bonus, this is the time to do it. To start betting, log in at your bookie of choice and use the menus to browse through all the esports betting markets on offer. When you find a bet you like, simply tap the odds to add them to your virtual bet slip. Then all you have to do is set the stake (i.e. how much money you wish to wager) and confirm the bet. Transaction limits, processing fees and withdrawal times can vary from site to site. See our guide to banking methods at esports bookmakers for more information. Korea is the motherland of esport as we know it, so it should surprise nobody that the East Asian nation is home to some of the world’s most prestigious pro gaming events. Below are but a few of the standouts. LCK is the top division for League of Legends esports in South Korea. The competition launched in 2012 and is widely considered the world’s strongest domestic league for LoL, with Korean teams going on to win the League of Legends World Championship five times in a row between 2013 and 2017. The Korean esports boom began with the original StarCraft competitions that started up in the early 2000s. Despite the rising popularity of games such as Counter-Strike: Global Offensive, Dota 2 and League of Legends, StarCraft II esports and the GSL continue to draw a massive following in South Korea. The Republic of Korea hosted the first four editions of the World Cyber Games, which made their debut in Yongin in 2000. Dubbed the ‘Olympics of esports’, the tournament ran every year until 2013 and featured representatives from as many as 78 countries. The WCG is scheduled to return from a six-year hiatus in 2019. Backed by one of Korea’s leading telecommunications providers, SK Telecom T1 were a dominant force in the old StarCraft leagues and have continued to pick up StarCraft II titles on a regular basis. The team has also enjoyed considerable success in League of Legends, winning the LoL World Championship three times between 2013 and 2016. Also bankrolled by the Korean telecom industry, KT Rolster (short for ‘roller coaster’) are giants of the StarCraft esports scene. They won the now-defunct StarCraft Proleague three times and have also enjoyed some success in the League of Legends realm, clinching the LCK Summer Split title in 2018. One of the world’s most recognisable tech brands was a major player in South Korean esports between 2000 and 2017. The Samsung Galaxy teams were especially prominent in League of Legends, winning the spring season of LCK in 2014 and taking out the LoL World Championship on two occasions. The Republic of Korea has an interesting relationship with gambling. All forms of betting were outlawed when the country was formed after the Second World War, and it was once illegal for Korean nationals to frequent casinos when travelling overseas. Korea’s gambling legislation has changed considerably over time. Betting on horse racing, boat racing and cycling was made legal only a few years after the initial laws were laid down, as were national lotteries. The casino ban was lifted in the 1960s, and now there are 17 venues that offer gambling games to foreign visitors. Online betting is another matter altogether. It remains illegal for a company or individual to operate any kind of internet gambling business in South Korea. People continue to flout those laws, however, and the country’s black market for online gaming and wagering has an estimated value of well over US $60 billion. While there are no online sportsbooks licensed in Korea, gamblers can take their business to any number of offshore betting companies. The government has blocked some websites, but that is no obstacle to anybody using a virtual private network (VPN). Korean authorities have no jurisdiction overseas, so there is very little they can do about it.